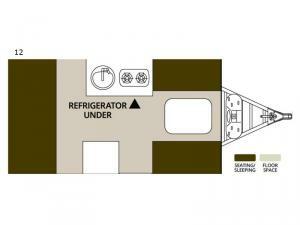 Imagine eating a meal at the dinette after using the stove with access to cold drinks in the refrigerator underneath. You can then head out to fish, hike, or venture around the campgrounds to return to inside comforts without having to worry about anything blowing away like with your tent. 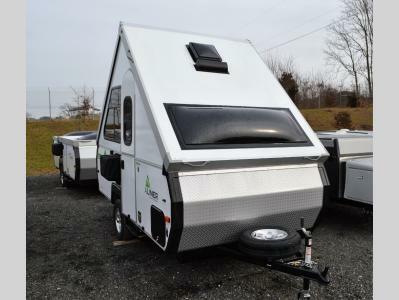 You will appreciate other standard features such as the two electrical outlets, the interior LED lights, and an outdoor shower to stay refreshed for the next adventure. The Ranger A-frame camper by ALiner can be your answer to a comfortable, lightweight, and easy to tow camping experience all wrapped up in a compact size. The windows and skylights provide ample natural lighting and easy access to the weather conditions and views outside. You can cook and store cold items, as well as sleep in each model. Whichever unit or layout you choose, the A-frame will last for years of outdoor fun. Began a new adventure in a Ranger today!